It’s so weird to be in a place I called home for ten years and feel so lost. I’ve lived in this house since 2004 and it never really felt like home to me, even when I was living in that house four years ago, repainted, replaced furniture I hated with furniture I loved and adopted a baby kitten and raised her in this cabin amidst the pines. Being here now in the cabin for a week with out my cat family and my boyfriend, most of my belongings moved out as my brother and I sand, paint and repair and get ready to place this house on the market, I just feel lonely being in this empty house. Plus I feel pissed and angry after my last Air B and B guest smoked in the house and I can’t remove the smoke smell to save my life. I feel like I’m breathing in second-hand smoke cancer with every great breath of air my lungs take. This is the mountains; pine trees and fresh air, why would you come hereand smoke and leave your trash and cigarette butts in this wonderful forest home? Anyways, my way of coping is intense interval training work outs that leave my muscles aching and my skin clammy. After an intense interval Insanity work out is the most delicious recovery drink and breakfast. 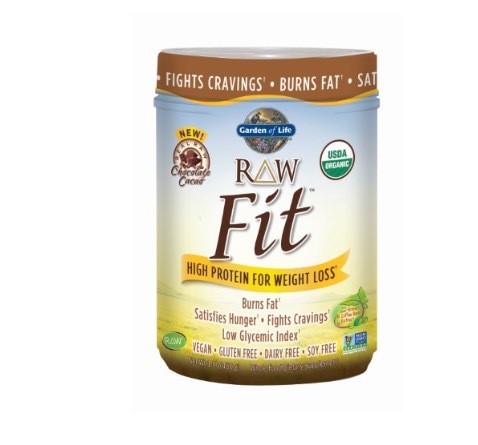 I am absolutely in love with this Garden of Life brand RAW protein powder from Whole Foods. I just wish it was so not so sweet. It’s hard to find a protein powder that is not sweetened and this one like many others is sweetened with Stevia. Dissolve the coffee in a just a few tablespoons of warm water. Combine the coffee, coconut beverage, cinnamon, ice cubes in a blender and blend until smooth. Thanks for sharing this recipe that sounds wonderful for the summer heat. Thanks for sharing on Real Food Fridays! Pinned & tweeted! They smoked in your home?????? Yikes, that is not ok. At all. Is there anything you can do? Can you charge them? Be sure to leave them a bad review on airbnb so other hosts know about them. I’m sorry about the transition, it’s always tough letting go of something. Thank you for sharing your recipe at HVF – I appreciate your support! I ended up having to rip up the carpet. (And I replaced with laminate hardwood so it looks a lot better but yeah, Air B and B does not look out for their hosts at all! I couldn’t even get my security deposit back!